In nineteenth century America, it was common for citizens to gather and listen to dense political oratory for hours at a time. 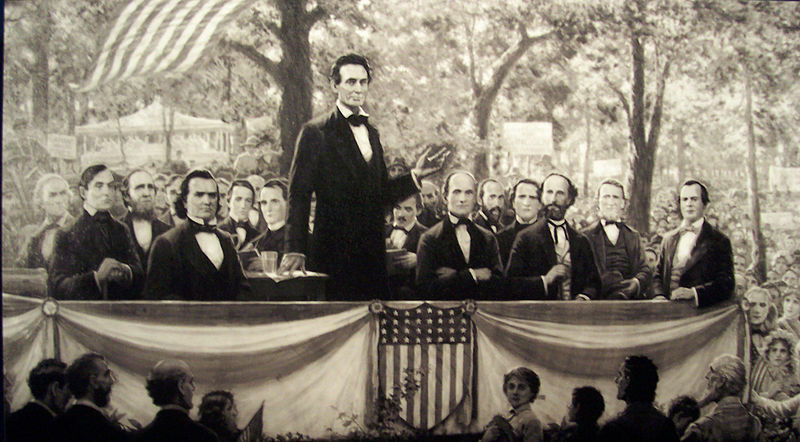 At the first of the famous debates between Abraham Lincoln and Stephen Douglas in 1858, Lincoln proposed that the debate be split in half to make it easier on the audience. The two men would share the podium for just four hours before lunch and three hours after—even with the break, an excruciating stretch of time by today’s standards. Yet the crowd that day reportedly listened with rapt attention for the full seven hours, only breaking their silence to express support or disagreement, or to applaud a well-turned phrase. Nineteenth century audiences regularly gathered by the thousands to perform similar feats of sustained attention. Neither Lincoln nor Douglas were considered prolix, yet just one of Lincoln’s responses that day ran to over sixteen thousand spoken words. Posted in Uncategorized and tagged Abraham Lincoln, consciousness, Kennedy, Marshall McLuhan, media, Nixon on February 13, 2012 by evanleatherwood.